Bennett College students, Nia Watson, right, Ariel Tindle and Destiny Edward wait in line to vote early at Brown Recreation Center on Friday, Oct. 19, 2018, in Greensboro, N.C.
Naomi Prioleau reports on a competitive race in North Carolina's13th Congressional district. The race for a seat in North Carolina’s 13th Congressional District is expected to be one of the closest in the state. The race between Republican incumbent Ted Budd and Democratic challenger Kathy Manning has drawn attention from national leaders like Republican Paul Ryan and Democrat John Lewis. Budd was elected in 2016 and he hopes to be re-elected for a second term. The seat was open after redistricting and it ended up being the perfect opportunity for Budd to run. 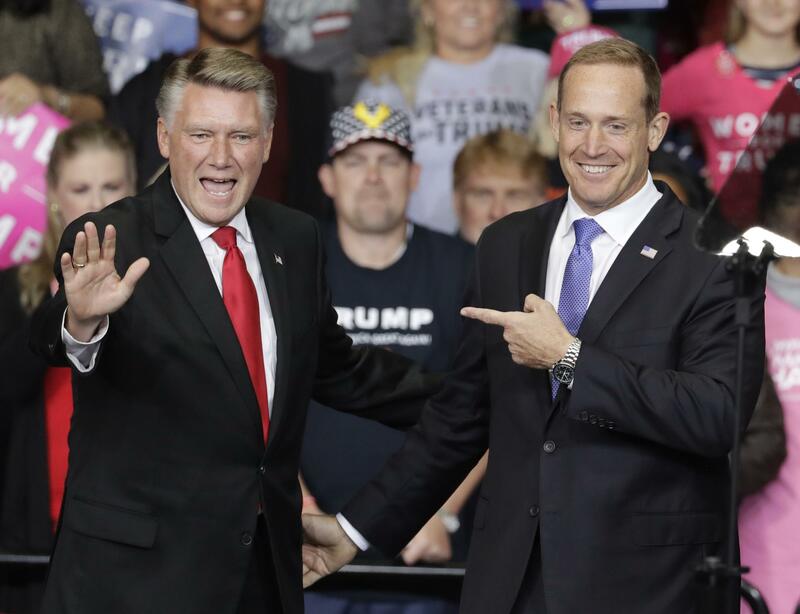 Rep. Ted Budd, R-NC, right, points to Republican congressional candidate Mark Harris, left, during a campaign rally in Charlotte, N.C., Friday, Oct. 26, 2018. Budd is from Davie County. He's the owner of a gun shop and shooting range and before being elected to Congress, he had never held public office. Neither has his main opponent Kathy Manning. Manning is an attorney and philanthropist in Greensboro and a newcomer to the political world. She’s lived in Greensboro for more than 30 years. She said she’s running because Congress is too dysfunctional. 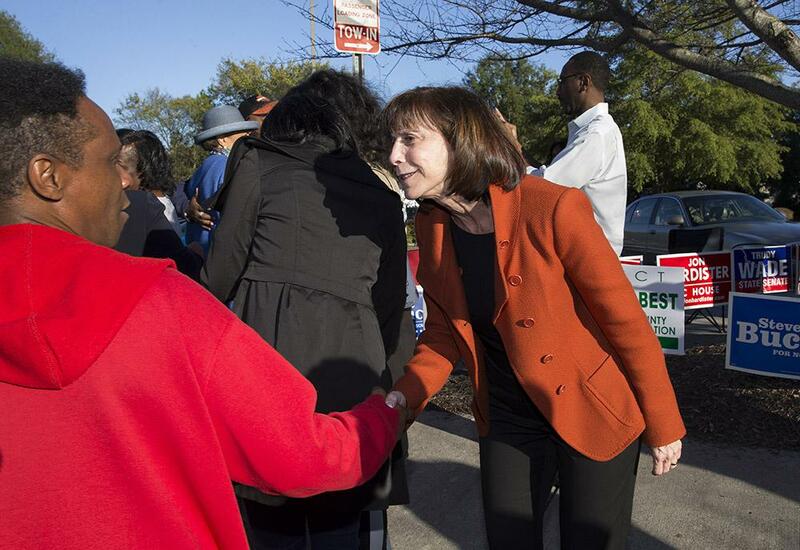 Kathy Manning, democratic candidate for the the 13th Congressional District of North Carolina, greet voters at a early voting site following an election rally at Bennett College Friday, Oct. 19, 2018, in Greensboro, N.C. The 13th District covers two-thirds of Guilford County and goes west across several rural Republican leaning counties including all or parts of Davidson, Davie, Iredell and Rowan counties. Democrats think winning the seat could help them retake the House. Tom Bailey of the Libertarian Party and Robert Corriher of the Green Party are also on the ballot. It’s projected to be a tight between Manning and Budd come Election Day. 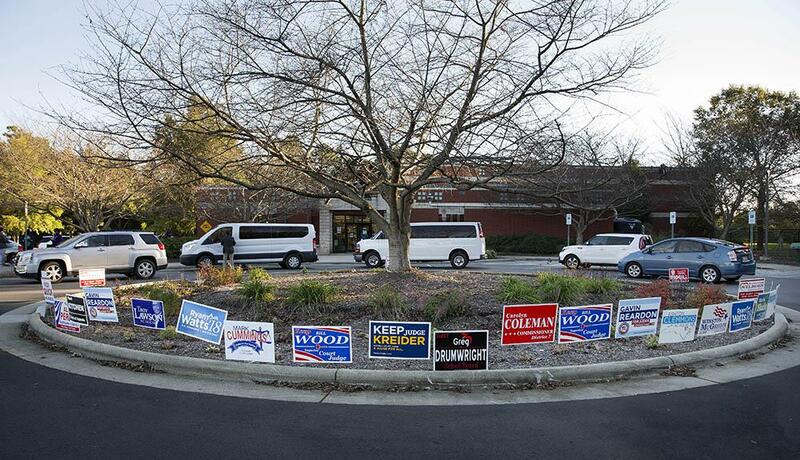 A caravan of vans carrying Bennett College students arrive at a early voting site following a election rally for Kathy Manning, democratic candidate for the the 13th Congressional District of North Carolina, at Bennett College Friday, Oct. 19, 2018, in Greensboro, N.C. Congressman Ted Budd grew up in Davie County in a family of small business owners. Even though he owns a gun shop and shooting range, Budd says there needs to be more enforcement of gun control laws in the U.S.
His opponent Kathy Manning shares a somewhat similar view. Manning was raised with guns in the home and said she doesn’t’ want the government telling her that she can’t have a gun. 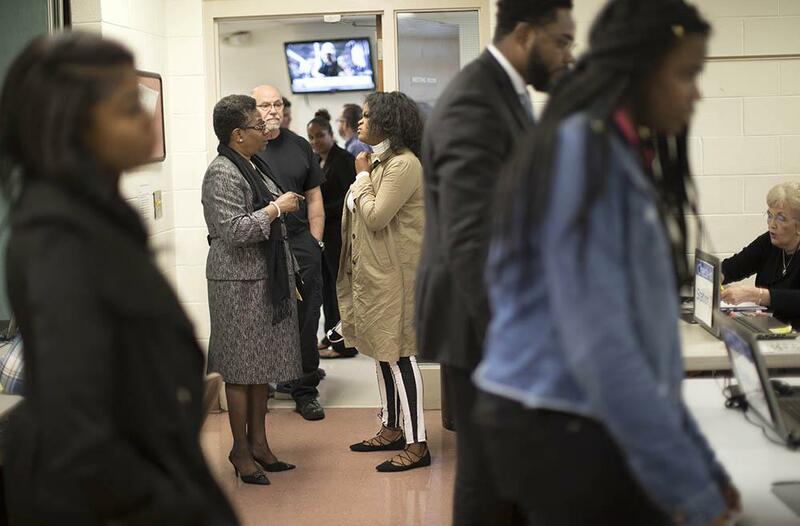 “We have got to find a way to take common sense measures to make sure guns aren't falling in the hands of criminals, terrorist, spousal abusers or people who pose a danger to themselves or others,” she said. When it comes to healthcare, Manning and Budd have opposite views. Budd said he's completely against Medicare for All and expanding any type of government-managed health care. Manning would rather take reasonable steps that can be passed on a bipartisan basis. Natalie McLean, second from left, Bennett College Chaplin, councils Bennett College sophomore, Lataija Gilmore on how to register for early voting at Brown Recreation Center on Friday, Oct. 19, 2018, in Greensboro, N.C.
Clarification: An earlier version of this story suggested Kathy Manning supports a version of "Medicare for All." A spokeswoman for Manning's campaign says the candidate does not support "Medicare for All."